ITIL 4 Foundation will be released in February 2019. The ITIL Specialist modules, ITIL Strategist and ITIL Leader will all be released in the second half of 2019, with detailed released dates available by the end of March. Dates have not yet been given for ITIL Master. How does ITIL 4 compare to ITIL V3? Whilst ITIL 4 retains many of the core elements of ITIL V3, and much of the existing guidance will be recognisable in parts of ITIL 4, there are no direct like-for-like modules between the two certification schemes. The ITIL V3 qualification will continue to be available until AXELOS advise that the transition period will cease. Therefore we would encourage you to transition to the new scheme as soon as possible. Once the V3 qualification is phased out, the Practitioner level certification will no longer exist. The transition will be a gradual process to allow learners to continue collecting their ITIL V3 Intermediate credits as these can be used as a prerequisite to beginning the ITIL Managing Professional qualification. 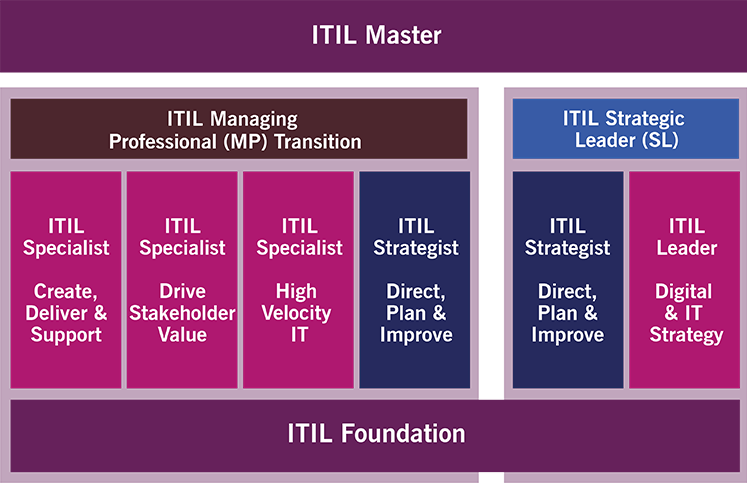 Where does ITIL Practitioner lie in ITIL 4? ITIL Practitioner will no longer be a separate module, however the knowledge and principles taught in ITIL Practitioner will be fundamental to ITIL 4 modules. If you have accrued 17 credits, then you will be eligible to take the ITIL Managing Professional Transition Module without having to take the MALC exam. ITIL4 will initially be translated into German, French, Japanese and Spanish. AXELOS will release more details in Q1 2019. AXELOS recommends completing the new course, as the exam in ITIL 4 differs greatly. However, if you have obtained 17 credits in the ITIL V3 scheme then you can complete the ITIL Managing Professional Transition Module instead. What are the certification levels called? One of the most notable features of the ITIL4 certification scheme is that it now includes two different designation streams - ITIL Managing Professional (ITIL MP) and ITIL Strategic Leader (ITIL SL). Both streams are designed to offer end-learners a clearer understanding of where and how they can enhance their skill set, giving them a competitive advantage. The two streams are made up of five modules. To be eligible to become an ITIL Master, end-learners must have completed both the ITIL Managing Professional (ITIL MP) and ITIL Strategic Leader (ITIL SL) designations. More information on becoming an ITIL Master will be released at a future time.